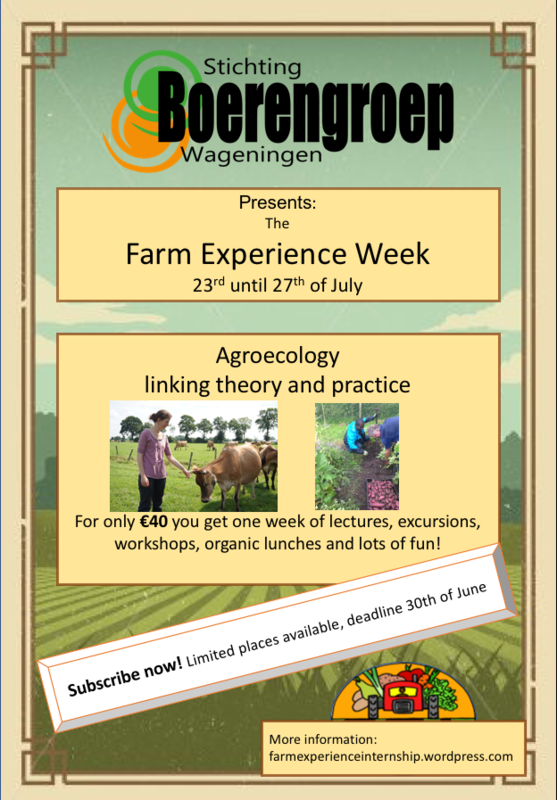 The Summercourse of Boerengroep is back this year in a slightly different form. This year we organise ONE inspiring week from July 23rd till July 27th. This week will be full of workshops, excursions, food and fun about topics as agroecology, soil, sustainable food systems and participatory research. On top of this, we can still support you in finding a farm to work at. The FEI is a growing movement, that is being co-created by peasants, farmers, gardeners, scientists, students, activists, NGOs and agroecological companies – working together towards a sustainable, healthy, viable food system that is fair and just for the earth, the consumer and the producer. Together, we co-organize a 3 ECTS international summer course at the Wageningen University every year (since 2013), which intends to bring together theoretical knowledge from students with practical skills and knowledge from farmers. Are you interested in growing your own food, discovering local knowledge and practices on organic farms and gardens in the Netherlands? Do you want to learn about agroecology, food sovereignty and sustainable food systems? Or would you like to interact and discuss with farmers to find creative, innovative ways of farming? Then don’t wait any longer and join the FEI! During the ONE WEEK FEI, you will get to know about all kinds of topics related to agriculture, e.g. agroecology, sustainable food systems, food sovereignty, seed patents etc. We share knowledge, eat together and have a good time. The week will be held at The Building with the Clock (Generaal Foulkesweg 37, Wageningen) and the schedule is full day. This year there will be a focus on new emerging initiatives in the Netherlands that work with an agroecological mindset (they are not always aware of this themselves), having a refreshing look on consumer relations and/or nature conservation. Mostly, the mornings will be in the Building with the Clock and the Afternoons we will be on excursions.